Domain Value: Do you get it? If you have the choice and are in the financial position to afford a home for your business, do you choose to set up shop in the middle of Times Square, or in a backwoods trailer off a dirt road in the middle of nowhere? The same choice exists between domain names, so investing in the better domain name for your business should also be a no-brainer. In the modern business world, the domain name is replacing brick and mortar real estate. Case in point, bed in-a-box online brands such as Casper.com and Purple.com are killing the retail giant Mattress Firm, which has been forced to file bankruptcy. Sears and K-Mart are also getting pummeled by Amazon.com and other online retailers. Domains are becoming more important that ever and should become the first priority for businesses. The land rush started many years ago. If that perfect domain for your business is on the market, the one that you don't have to worry about outgrowing, GRAB IT!, or someone else will. Startups in particular have a great challenge. Most are internet driven, but the best domain names are long taken. When they do come to market, there may be a small window of opportunity to acquire the domain that will become essential to the long term survival and growth of your business. There is a definite scarcity of quality domain names in the market and each domain is one of one. While "made up" words make for distinctive brands and can sometimes be available to register, the easier it is for someone to pronounce, spell and to associate the name with something common or the industry you serve, the better it will be for you and your business. If you are a startup, I highly recommend you also check out this extremely well-sourced article by Michael Cyger called Getting Traction and Funding is Way Easier with a Great Brand. It breaks down real world data on names/domain names and startup funding from investors. In the area of generic category defining keyword domains, they don't just to give a marketing asset to your brand, but owning your category killer also keeps competitors from getting them and leveraging them to gain and eat into the market share. You are probably here because you don't quite understand how you can register a new domain name at your registrar of choice for $10-$20, but someone owns the domain name you want and is asking thousands of dollars, hundreds of thousands of dollars, or even millions. To understand the domain name market, what you need to see is true, verified, end-user domain sales data. I hope that you will read this blog and have a better understanding of the value of domains and the competition driving the domain aftermarket. 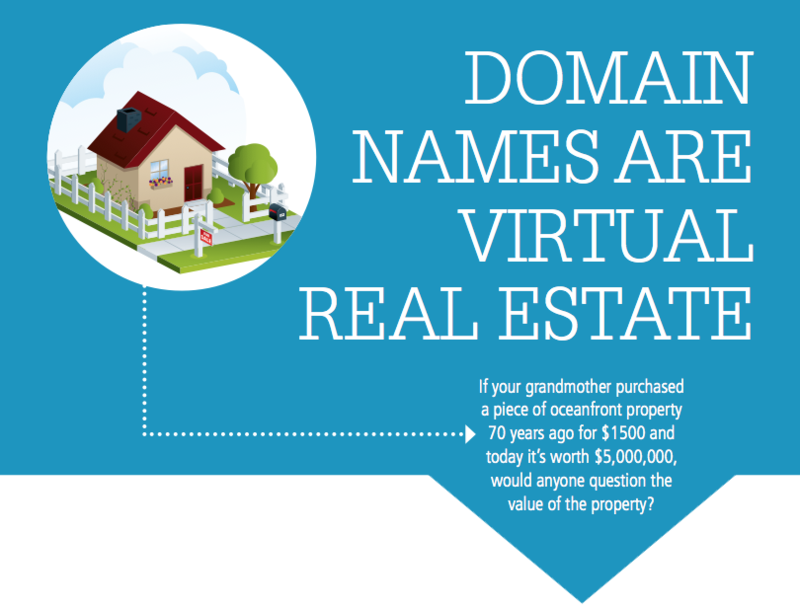 What makes a domain name valuable? A domain name is quite possibly the most critical digital asset and marketing tool a business can own. The king of the domain extensions is the ".com", and any other extension should be the second option. A ".com" value will be exponentially higher than any other extension. Due to the high demand for domain names as businesses continue to come online, there have been countless new extensions released, but ultimately the ".com" remains unchallenged. The following link will take you to archives of weekly publicly reported domain sales. There is rarely a week that goes by without publicly reported 6 figure domain name sales. There are multiple 5 figure sales every single week. Take a look at a few of the recent weekly reports. A domain name has global reach, while a physical building, billboard, magazine, TV, Radio advertisement, etc., is geographically limited in its reach, or limited to the distribution of the print materials or broadcast. A domain name is your information portal, your storefront, your press release,your communication channel (through contact forms and domain related email addresses), your brand identity, your reputation. Your domain name is always on, always open 24/7, always visible, always available to provide information regarding your business. A good memorable premium ".com" domain saves you marketing expenses and manpower. It establishes your credibility and authority as a market leader and sets you apart from the pretenders. The right domain will determine whether a potential lead will become a customer, client, investor, or skip over you all together. After all, if you are not willing to invest in your business, why should they? When they see that your company email address is has some overly long, or hard to remember hyphenated domain, in a strange unfamiliar extension, how credible are you? Purchasing a premium domain name is an initial investment that will add significant value to your business year after year with an extremely low maintenance cost. Most domains can be renewed indefinitely for a few dollars a year. The domain is the backbone of the modern business and the value it adds cannot be overstated. It especially comes into perspective when compared to other marketing expenses that will come out of a company's annual budget with significantly less return. You know what else makes a domain name valuable? Competition. If its a good name, its taken. Someone has already thought of it, it will not ever be available for registration fee again. Once someone has it, they will hold on it it and continue to renew it. Even if they let it expire, you chances of obtaining it are slim. Every day thousands of people are watching and bidding on quality expiring domains, which are sold at extremely competitive auctions through popular domain name registrars and auction houses. They are sold before they ever drop and become available. So if you have been waiting for a domain you want to expire and become available, but found out that someone else beat you to it. This is why. High quality ".com" domains can only be obtained through the aftermarket, and not for basic registrar initial registration fees. Whatever you do, do not rely on junk automatic appraisal websites. They are a joke in the domain industry and do not accurately reflect any of the intangibles that a coded script cannot weigh. Ultimately, domain value is based upon what is the likely best use of the domain to maximize its potential as a business marketing asset, and the domain will likely be priced accordingly. Great domains are going to continuously add value to your business. So what is a great domain? The most important element of a great domain be that it is easy to remember, pronounce and spell. A domain can be much easier to remember than a phone number. Second, does it fit your brand or your product/service area? There are many characteristics that make a domain desirable, and thus demand a premium price. We hope that this has been helpful and insightful. Mega businesses that we grew up with are failing every day because they didn't embrace the power of their web identity. Meanwhile, the most successful players of today and tomorrow are stockpiling domain assets to protect their brand identity and set them up for future marketing campaigns. Working with experts in domain identity and branding experts through YESnames.com will get your business on the right track to reap the benefits of a premium domain for years to come. How do I safely buy a domain? So, you have found the perfect domain name for your business, it is for sale, and you cant wait to get it in your account and get started building and marketing. YES! But then you think to yourself, "Wait a minute, I dont know this person. How do I know they actually own the name? How can I trust them? What if I pay them and I dont ever get the domain name?" Your concerns are valid and prudent. Many buyers often feel embarrassed that they don't know how to verify ownership of a domain or don't feel comfortable or confident in buying a valuable domain name from a complete stranger. While we complete multiple domain transactions and ownership transfers on a weekly basis, for many of our buyers, they have only ordered an available domain name directly from a popular domain registrar. These are questions you need to ask, and you need to be confident in the seller's answers and transaction method before proceeding. First, to verify information on ownership, there are a number of web services that offer "whois" information lookups. You simply find a "whois" information website using your favorite web browser, enter the domain name in the search box, and the results should give you the name of the registrant, administrative, and technical contacts for the domain. The "registrant" is what we call the domain owner. "Whois" information will also have the contact email address for the domain, the address of record for the owner, and a phone number. Sometimes due to privacy concerns, the owner of a domain will hide their identity and personal information by utilizing a "whois" privacy service. In these instances, it may be more difficult to verify ownership of the domain. For the domains YESnames sells, we always have a web page set up with our direct contact information on the page. We also never utilize "whois" privacy so that you as a buyer may verify ownership by our company MOLTOV. USE A TRUSTED DOMAIN NAME ESCROW SERVICE! When buying a domain, especially when the value is over $1000 of your hard earned cash, it is always a good idea to utilize the services of a reputable and well established escrow service that can facilitate domain sales transactions. We have had an excellent experience with the ease of use, speed of transactions, and customer support from the team at Payoneer Escrow. It has been an affordable and reliable service and we highly recommend the use of this service when agreeing to a domain sales transaction. The escrow fees on transactions below $5000 are the best in the industry. Another Alternative in the market is Escrow.com. This is the most well known and widely utilized internet escrow service. We also have used Escrow.com to close dozens of domain sale transactions over the last couple of years and we also believe they offer a great service to protect both sides of a domain transaction. Escrow.com does require some additional identity verification steps based upon the amount of the transaction. This has sometimes caused difficulties and delay particularly with larger or international transactions in our experiences. It is however a very established and solid choice to handle a domain transaction. HOW DOES A DOMAIN TRANSACTION WORK? Once the buyer and seller agree to a price and to initiate a transaction, the buyer will need to sign up with the domain escrow service of choice if not already set up and verified. A domain escrow agreement is set up and both parties log in and agree to the transaction. The buyer submits payment to the escrow account. Payment options may be paypal or credit cards for lower priced transactions. Transactions over a certain amount will in most cases need to be paid by ACH bank transfer, International Wife Transfer or Certified Check. There is a fee associated with the escrow service, and it is usually a very small percentage of the total purchase price (1.5-6.5% depending upon the final price and escrow company used). Once the escrow company receives the payment, they instruct the seller to transfer the domain. The seller then will communicate with the buyer on completing the domain transfer and provide transfer codes or obtain information needed to push the domain to the buyers account with the same domain registrar. After the transfer is completed, the seller will mark the domain as transferred and this starts a "review period" where the buyer can verify control of the domain, and once verified, can accept the transfer and approve the payout to the seller. If the domain is not transferred, the buyer may initiate a dispute and the escrow company will hold payment until the dispute is investigated or until the transfer issue is resolved and the buyer accepts the domain and authorizes the payout. This is the safest way to handle a domain transaction, and whether you buy from us, or from another domain owner, we highly recommend that you use a domain escrow service to protect yourself in these transactions. So now that you are armed with information on how to buy a domain from a seller, go check out our portfolio at NamePerfect.com and find your perfect domain!